Whether you have true blood or twilight thoughts, you'll love this full set of vampire teeth. 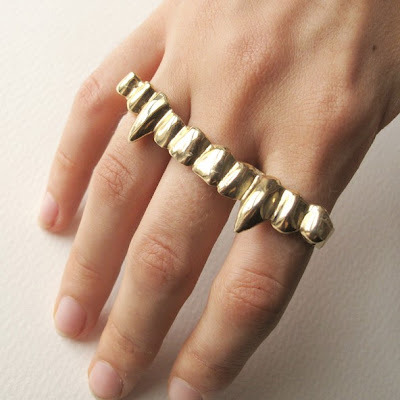 A striking and unusual ring/duster to show off your vampire style. Happy Hallowe’en! 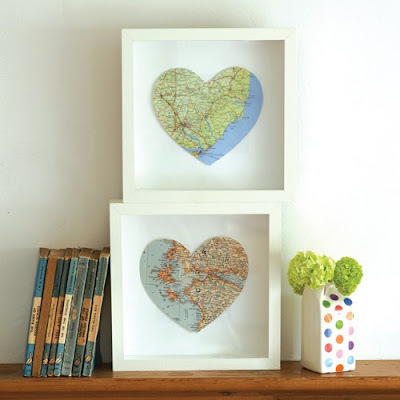 Hand glazed, hand cut giant framable vintage map heart. The location of your choice is selected from the artist's map collection and hand bonded giving it a stiff, glossy painted texture. The map is then hand cut to shape and mounted. This beautiful A4 piece was hand cut from matt black paper. It would look perfect by itself in a frame, or over your favourite image/illustration to create an interesting and unique contrast. "A friend once told me of a kayak trip she was on in Alaska. As she kayaked across the water a big whale swam very near to her. He brought his huge eye to the surface and looked right at her and blinked before drifting deep below". That story was the inspiration for this piece – an original collage of parchment paper, newsprint, and old paper (to create a vintage look), on quality cotton painter's canvas. Additional coloring and toning was added to the surface before it was sealed. Each piece is unique and is signed and dated by the artist. This gorgeous but poorly repaired book ("Where wild birds sing" by James E. Whiting) was found in a little second hand book shop. Most of the pages had escaped their binding and the poor thing was quite beyond repair. 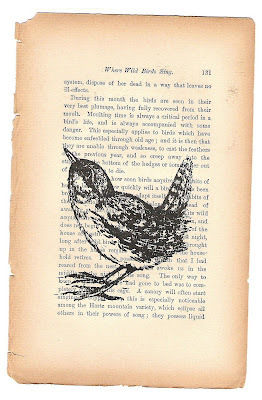 The language is quite poetic and since it's such a shame to waste a good book, Inkmeup felt that a little wren gocco print would please Mr Whiting no end! Each print is unique and ready for framing. Slipcast milk jug in clear glazed porcelain with vibrant transfer decoration. 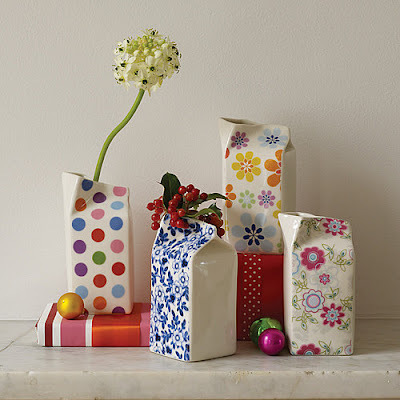 Handmade by Hanne Rysgaard. 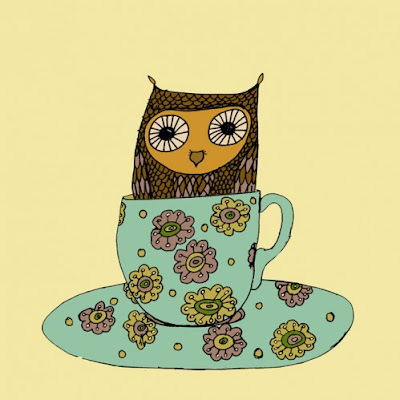 Beautiful 8" square owl illustration printed onto archival paper, signed and dated by the artist. 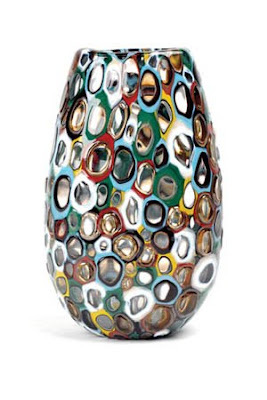 Very, very beautiful and unique, sculptural glass vase by Caleb Siemon. No more trying to shove icing, cake batter, and sprinkles into an envelope! 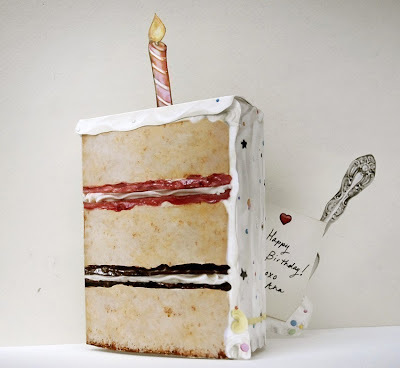 This is a pop up card that turns into a piece of cake. The cake card is beautifully illustrated with traditional icing, a lit birthday candle, lots of sprinkles, and chocolate-vanilla-raspberry filling! It's really hard to believe that this is a pop up illustrated card! Stunning! 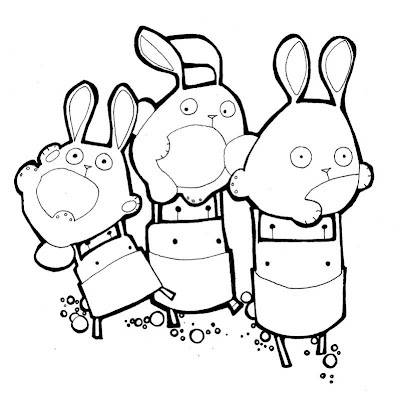 Those meddling robots are up to it again – this time storming the bunny camp and running amok! Whatever will we do? Well, its about time bunnies and robots worked out their differences anyway. Set of 4 blank note cards. 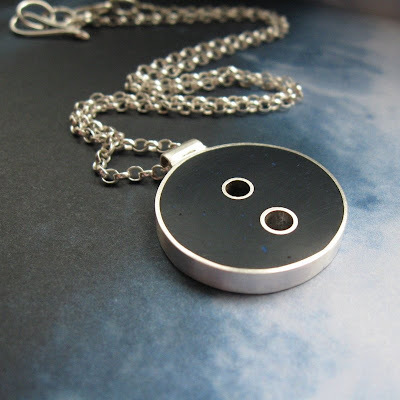 A penumbra of sterling silver surrounds the deep indigo blue resin of this full moon pendant. A gorgeous colour to complement any outfit and a classic design with a twist. This pendant is very versatile with a lovely calm feel. 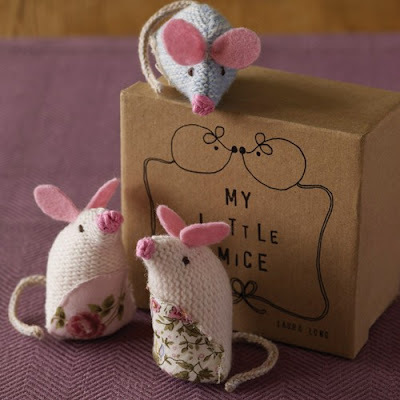 Three little knitted mice, each with a character of their own. They stand up tall and peep out from their little box to see what is going on around them. Mice are nosey little creatures! Handmade using the finest lambswool and decorated with vintage fabrics. 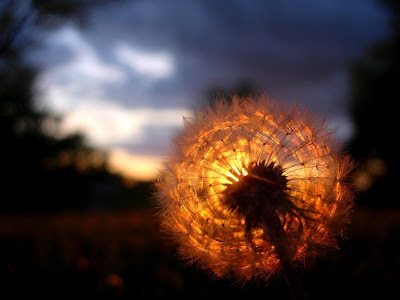 Gorgeous 4"x6" fine art photograph of the last rays of sunset caught through a dandelion seedhead. Have you ever wanted to tell your story and hang it next to your heart? 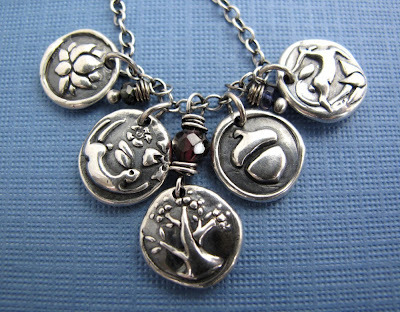 Custom designed to tell your story, this necklace uses sterling silver, gemstones and fine silver hand formed charms. The charms have been antiqued and polished to produce a gently aged patina. 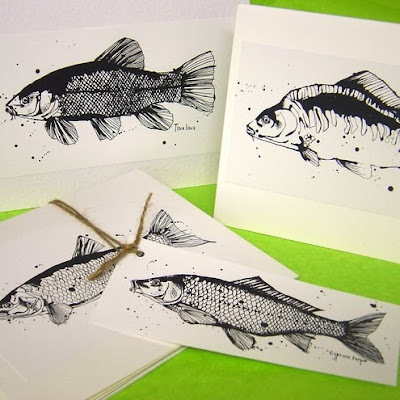 These beautiful illustrations have been reproduced from the original stick and ink drawings and turned into a set of gift wrapped greetings cards. A wibbly wobbly "jelly on the plate" necklace! 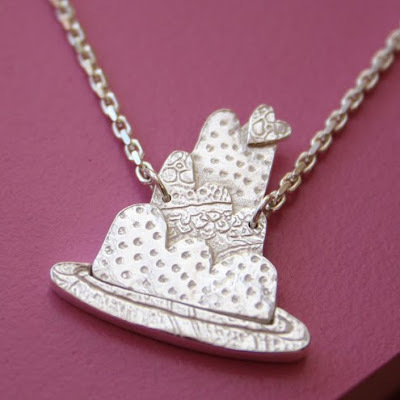 Handmade fine silver jelly with a dotty/floral texture and embellished with a love heart. Each handmade jelly necklace is unique. 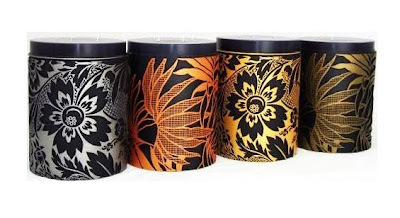 With relief patterns derived from a unique collection of vintage wallpaper printing rollers and silk screens, these luxury candles have been cast, processed and finished by hand. They embrace the beautiful art of wallpaper design in a new form by faithfully replicating the patterns from the cherished vintage artefacts. 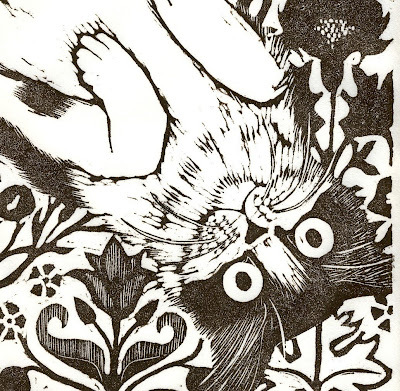 Original linoleum print of Ashes, who likes to hang out like this on her back. She even sleeps this way! Hand printed on Mulberry paper, in Daniel Smith Sepia ink. Paper size is 10 x 12", printed area is 8 x 10". 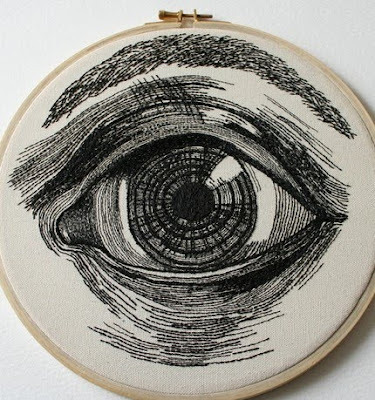 This intricate hand drawn eye has been painstakingly embroidered onto a creamy linen-like cotton and stitched in black linen and polyester threads. 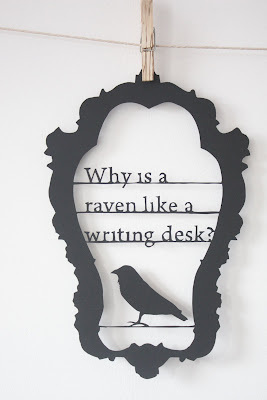 The embroidery comes in it's wooden hoop frame ready to hang and measures approx 10 inches in diameter. Bring out your inner child with this colour-it-yourself poster. Screenprinted in strong, bold black ink and ready to be filled with colour in any medium you prefer! 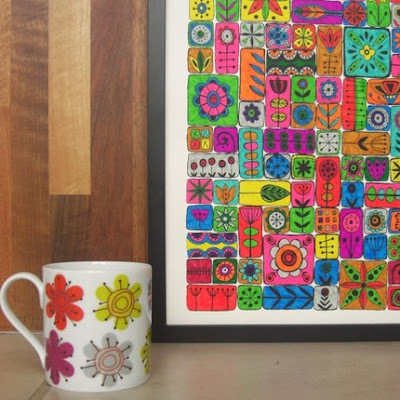 Paint, ink, collage, felt tip pen, pencil, the choice is yours...go colourful, go monochrome, or frame it like it is! This fantastic hand cut necklace pendant is drawn freehand onto an old English copper penny. 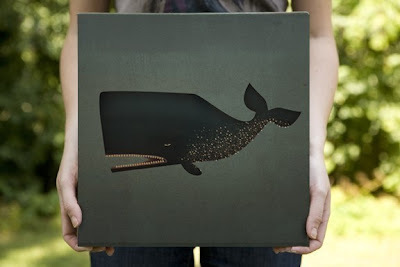 Several holes are drilled and the sections are delicately cut away. The edges are filed, smoothed and finally polished. 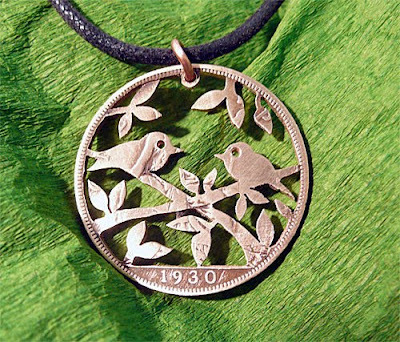 The end result is a beautiful, original, recycled pendant – with history! 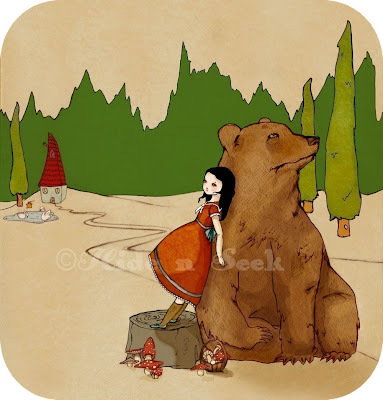 Beautiful fairytale giclée print from an original illustration. Signed and dated by Eloise, the artist. 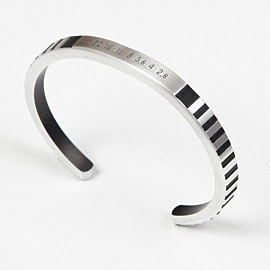 Recycled from used camera components by Craig Arnold / re:vision, this cuff is thin and stylish enough to fstop traffic. re:vision brings old school cameras into an entirely new focus. Each piece is one of a kind and sells fast. Available online exclusively at Oye Modern. 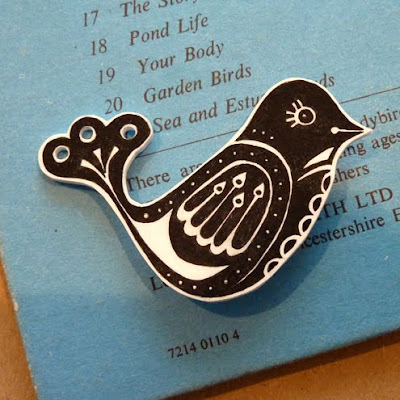 This vintage-inspired bird brooch has been hand-illustrated in ink onto plastic. The plastic is then heat shrunk to ensure colour fastness and durability. 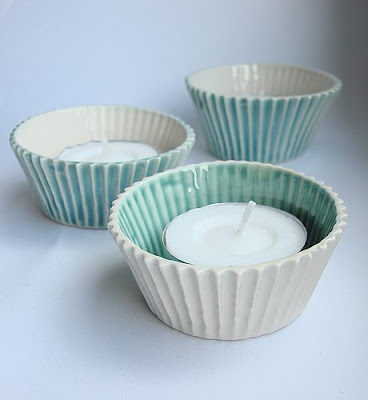 Set of three handmade ceramic cup cake holders, perfect for a tea light or for nibbles. These have been cast in a mould taken from an actual muffin case. Beautiful! 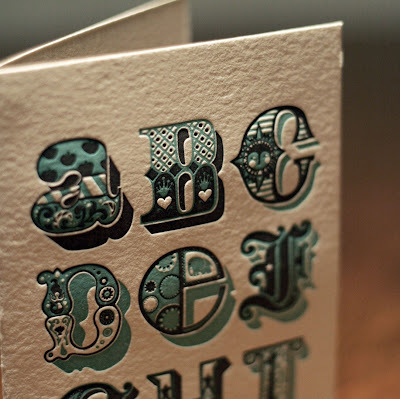 This hand letterpressed card features an original illustration with amazingly fine detail. Printed in Tiffany blue and charcoal on 100% cotton ecru paper. 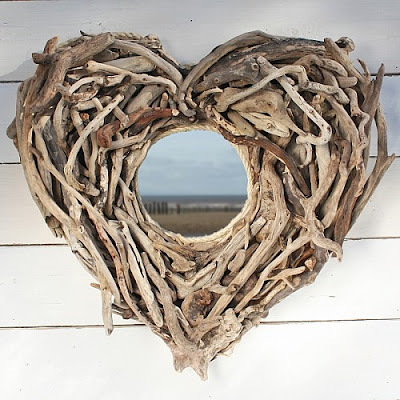 A beautifully created heart shaped driftwood mirror. This individual and quite unique item is sure to capture the imagination with its twisting use of natural shapes colours and textures. If you were a spirited young woman who's Grandma has just gone missing, what would you do? Advertise, obviously! 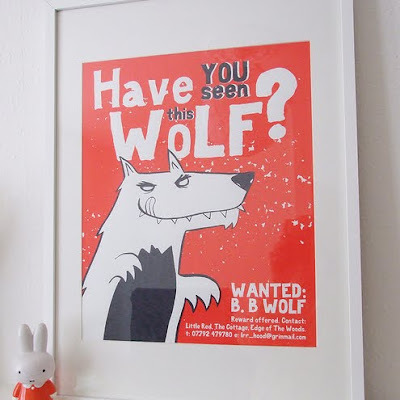 A two-colour A2 hand pulled screenprint from the Little Red Riding Hood series. Every print is numbered, signed and dated and is from a very limited edition of only 20. 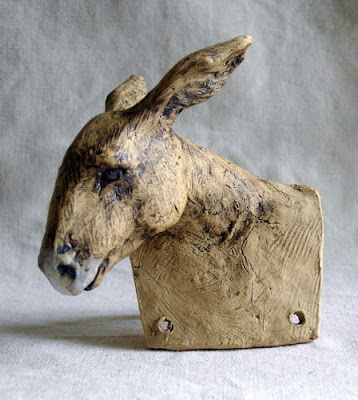 Ceramic donkey doll head. At only 9.5 cm tall this piece shows incredible charm and detail. 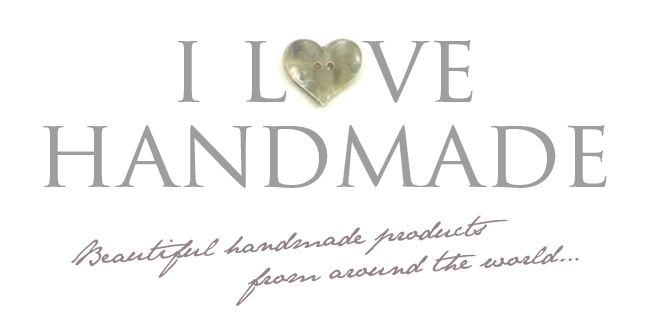 Jennymade now has the honour of being the first artist to be featured twice on 'I Love Handmade'! 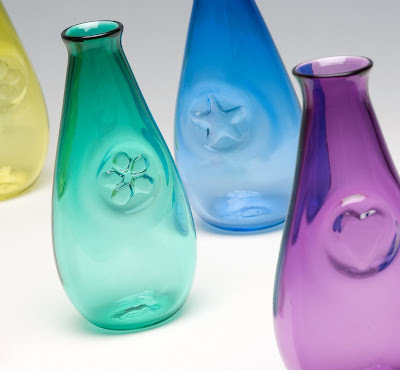 Subtle, but sweet…handblown glass bud vase, stamped with a heart, star or flower. Available in a range of colors, signed by the artist on the base. Mixed metals ring. 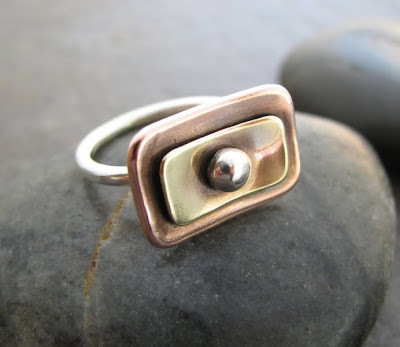 A beautifully substantial sterling silver band, with layered copper and brass rectangles accented with a sterling silver ball.